Spinning consists of three actions that happen more or less simultaneously: Drafting the fibres, twisting the drafted fibres to form yarn, winding yarn onto the bobbin. Your hands do the drafting, the spinning wheel twists the fibres and winds on the yarn. Every turn of the flyer twists the yarn once. Fine yarn needs more twist than bulky yarn (in order to feel and handle the same). The yarn is wound onto the bobbin when flyer and bobbin turn at different speeds. When you treadle once, the flyer turns a certain number of times. The wheel's ratio determines how big that number is. For example, a 6:1 ratio (or 1:6) means that the flyer turns six times for each down-and-up movement of the treadle. If you choose a higher ratio, the flyer turns faster, maybe 18 times for each treadle movement (ratio 18:1), meaning three times as fast as with a 6:1 ratio. Supposing your foot moves always at the same speed, then the yarn is twisted faster at a high ratio than with a low one. The logical conclusion is that fine yarn is best spun with a high ratio (so that a lot of twist is inserted fast) and bulky yarn with a low ratio. If you cannot change the ratio, you need to either reduce treadling speed for bulky yarn (so that twist is created more slowly) or draft the fibres faster (so that the twist is distributed over a longer stretch of yarn). Or both... The opposite is true for fine yarn. By the way, yarn diameter is determined by the number of fibres drafted - many fibres result in a thick yarn and few fibres in a fine yarn. 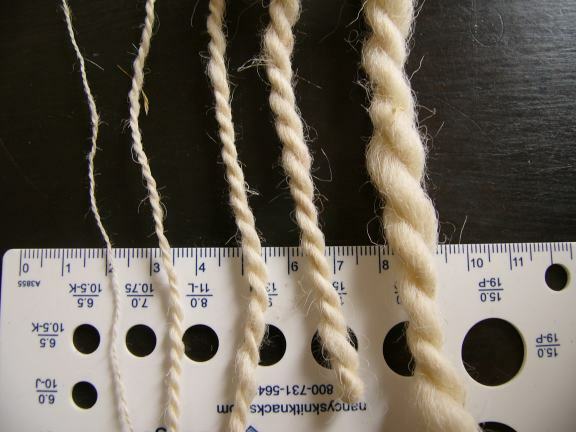 And it is more difficult to spin a regular bulky yarn than a seemingly regular fine yarn - when the 2-ply measures 25 wpi (1 mm), a 10 % difference in diameter is hardly noticeable. When the speed difference is small, the yarn is wound on slowly, when the speed difference is large, wind-on is fast. Fast wind-on corresponds to strong take-up - the wheel pulls noticeably on the yarn. There's three methods to create take-up which are explained on the page How Flyer Wheels Work. Here I'm talking about which take-up is correct. The simple answer is: The one you like. Usually spinners use strong take-up for bulky yarn and low take-up for thin yarns. But how strong is "strong" is your decision. Only one thing is sure: If you don't let go of the yarn, it can't be wound on!